When I read about the passing of Maurice Sendak earlier this week my thoughts were flooded with memories. Back to the days when I was not only a mother of two small children, but also the pre-school art teacher for a community arts education center. Gee it seems like yesterday, and Sendak's book Where the Wild Things Are played such an important role in helping me foster the imagination and creative process in the hearts and minds of the very young. I vividly remember standing at the head of the table for my weekly classes. Eight to ten students, 3 to 5 year olds, all covered up in smocks that were way to big for them. They would be sitting on tall stools around a large canvas covered table that had been made for specifically for the clay studio. They would sit completely still, eyes wide...listening to every word I said as I read to them the story about the Wild Things. "Wow, those Wild Things are really something! Have you ever seen a Wild Thing? They live in the basement! In your Closet?? Oh my gosh! Are they friendly? Not mine, he scares me..his eye's glow. I eat lunch with my Wild Thing. You DOOO?? WOW, what do you guys eat? Oh you're making my tummy 'so' hungry! What does your Wild Thing look like? Mine is big, and he has 3 heads and green skin! Well mine is yellow and he has 3 hands and hops of one foot! it look like? Would it be scary or happy? Would it swim or have feet? What color do you think it would be? And remember you need to think about food too. Your Wild Thing will probably get hungry so you may want to make him a snack for him! 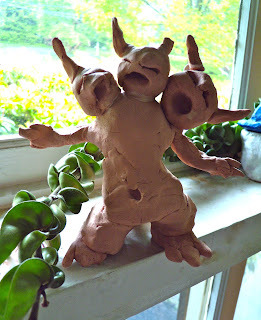 and on and on the conversation would go until the kids...imaginations on overdrive...would dive into the clay to create their own little Wild Thing world. During this time period my own two pre-school kids would also attend classes fairly often. And they would soak it all in, the book and discussions, fueling their own imaginations and ideas right along with everyone else. I always tell people that your child at age 3 or 5 is not going to be that different from your child when they are grown and in their 20's. (something everyone finds hard to believe, but it's true). Well, its over 20 years later. My son always has, and always will be, a 'Wild Thing' in his own right. His creative imagination is still on overdrive and everyday as he continues to create his is own visual, imaginative world for himself and others to enjoy. My daughter? Well, she never really was a 'Wild Thing'. She proclaimed from an early age that she was the 'Princess of the 'Wild Things'...a title that she still holds today. I have a feeling that she's waiting to become 'Queen'...but since I've already filled that role I guess she has a little longer to wait! Enjoy your Mother's Day, your own little 'Wild Things' and thank you Maurice Sendak for inspiring so much joy and creative imagination in others with your wonderful little book! And thank you to my own kids and all the other little 'Wild Things' that I've taught over the years, that have allowed me to play right along with them in my own 'Wild Thing World'. It doesn't get any better then that!